Charlotte Brown used her seeing-eye dog to navigate the track. An electronic beeper with a high-pitched signal told her when it was time to jump. 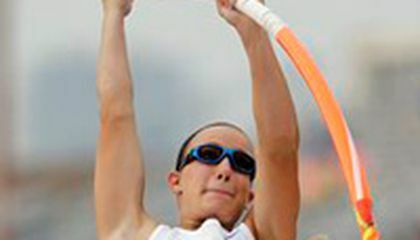 About 90 minutes later, the blind pole vaulter had cleared three heights, soaring 11 feet to earn a tie for fourth place at the Texas high school state championships Friday. Brown, who finished eighth a year ago, received a standing ovation at the University of Texas track, but fell just short of a medal. And that made it a mixed afternoon for an athlete who has overcome great adversity to rank among the best in the state in such a physically demanding event. Brown was clearly proud of her improved finish, but there was a hint of disappointment in the 16-year-old junior who believes she can earn a state championship medal. "The main goal is to win," Brown said. "Today wasn't my best day jumping. ... I moved up four places. Hopefully, I can move up four places next year and win it." Brown qualified for the state meet at a height of 11 feet, 3 inches. That tied for third best among the nine competitors in Class 3A, the state's mid-sized schools. She breezed through her first three vaults, clearing 10-0, 10-6 and 11-0 on her first attempt at each height. A year ago, Brown cleared 10-6 before she was knocked out. Her trouble came at 11-6, with her twice hitting the bar on her way up. When she finally fell to the mat after he third miss, she stood with slumped shoulders. But she drew a standing ovation by several hundred people in the corner of stadium by the vault pit. "I wanted to go higher, but to be cheered like that is pretty cool," she said. Kally Long, who won the event at 13-2 to defend her state title, was impressed by Brown's improvement from a year ago. "The fact she fights so hard for everything she wants, it was awesome to see her do better than last year," Long said. Brown lives in rural Emory, a town of 1,200 about 65 miles east of Dallas. She was born with normal vision but developed cataracts when she was 16 weeks old. That led to the first of several operations, including insertion of artificial lenses. Her vision stabilized until she was about 11 when it started to worsen. In 2013, Brown still had pinhole vision but couldn't see color or distinguish shape from shadow. Now she says she's completely blind. Brown vaults with a combination of fearless abandon and meticulous attention to detail. She counts the seven steps of her left foot on her approach and when she picks up the sound of the beeper placed on the mat, it's time to plant the pole and push up. Her seeing-eye dog, Vador, who she gives the nickname "Darth," sat behind the jumpers on the track and waited for her to finish. Twice on Friday she delayed jumps when the booming public address announcer introduced medal winners or competitors. Brown waited him out and meet officials eventually asked for quiet. The beeper was a recent innovation that was needed as her vision became worse. Brown, however, is optimistic that because her sight is now completely gone, she'll be a better vaulter because she won't have to constantly adjust to new training methods. "I guess people think it's frustrating to have to change all the time, but that's what life is, it's changing all the time," Brown said. "When I lost the rest of my vision, I just thought of it as another chance to overcome something. ... The bright side is, I'm already totally blind. I don't have to figure out another way to vault. I can't get any blinder. What I figure out now will work the rest of my vaulting career." Critical thinking challenge: Charlotte didnt win a medal, but she got a standing ovation. Why? It's amazing what disabled people can can do, it's really inspiring to puts some people to shame. I think it's really cool how she got 4rth place well tied for 4rth place to be exact but still amazing how she's blind and is able to do that. This story is very incredible and just proves that you should always try and do your best ! To always give everything you have and always strive to be the greatest under any circumstance like this incredible women. I wonder if it was hard to run on the track with her dog. Also how did the other runners run if a dog was on the track. also i cant even do that and i can see its amazing how she can and she cant see at all. She is A M A Z I N G even if she didn't win. She won a standing ovation because of her effort and her hard work. That's just amazing being blind and look what she can accomplish. 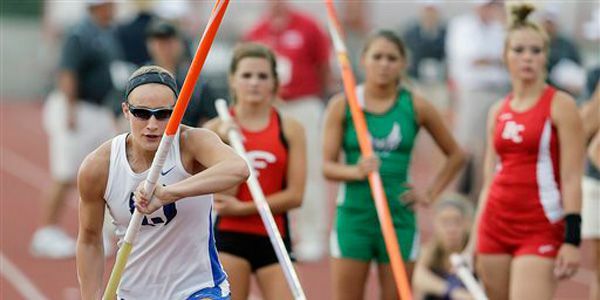 A blind person is the best pole vaulters in Texas. That is pretty interesting. Bit it will take lot of work to be good in pole vaulters wen your blind. The blind pole vaulter should like pole vaulting. I wonder what does she does to make her good at pole vaulting. I liked that Charlotte Brown l is blind and tied for 4th place when other people were not blind and could see where they were going.That is also an advantage of the people that can see.Plus also tied in 4th place is so good even if you are not blind.Even the Kally Long that got in first said that she got a hole lot better than last year. Last year year she got in 8th place but this year she got in 4th place.But if that to me Happened i would have never gone that far. This article is about a girl named Charlotte Brown. She is know for being blind and being able to pole vault.This was taking place in Texas.This happened about a year ago.She was able to do this by having a beeper in her ear to tell her when to go. she got a standing ovation because after all she has been through she is still prospering. she is still making an effort to succeed doing what she loves and many people respect that. They gave Charlotte a standing ovation because she didn't win the competition she miss twice and her third time she got it. The standing ovation showed that they are proud of her and she is trying something that you have to see and she is trying her best.